Boys with autism who carry rare, spontaneous mutations have lower intelligence quotients (IQs) and more severe symptoms than do those who may have inherited the disorder. The finding, published 21 October in the Proceedings of the National Academy of Sciences1, hints at two classes of autism risk with varying severity. “Understanding how the genetic heterogeneity is actually leading to phenotypic heterogeneity is a very exciting time in our research,” says lead researcher Mark Daly, associate professor of medicine at Harvard University. The researchers looked at harmful mutations present in 618 boys with autism but not in their parents or unaffected siblings. The researchers initially included 152 girls with autism in their study. This number turned out to be too low to spot any meaningful trends between spontaneous mutations and IQ. However, these girls have double the rate of harmful mutations compared with the boys. This is in line with the finding that girls need a bigger genetic hit to develop autism than boys do. Boys with IQs below 100, the population average, have a high rate of spontaneous, or de novo, mutations, the study found. They also have more severe symptoms than boys with higher IQs. This suggests that harmful mutations track with both IQ and autism severity. By contrast, boys with autism who have IQs higher than 100 have the same number of de novo mutations as do people without autism. This suggests that themutations do not contribute to autism in these boys. The boys with higher IQs also tend to have a family history of psychiatric disorders, suggesting that inherited milder mutations may have combined to cause their autism. “It seems as if the higher-IQ boys [have] a different class of genetic mechanism,” says Michael Wigler, professor at Cold Spring Harbor Laboratory in New York. Wigler was not involved in this study, but has found similar results. In a study published last week, he and his colleagues reported that de novo mutations are present predominantly in children with low IQs. One harmful de novo mutation in an autism gene can lower IQ by about 5 points, and two mutations by about 20 points, they found. Wigler’s study also found that de novo mutations may account for just under one-third of the risk for autism. This is the latest in a string of results suggesting an important role for de novo mutations in autism risk. 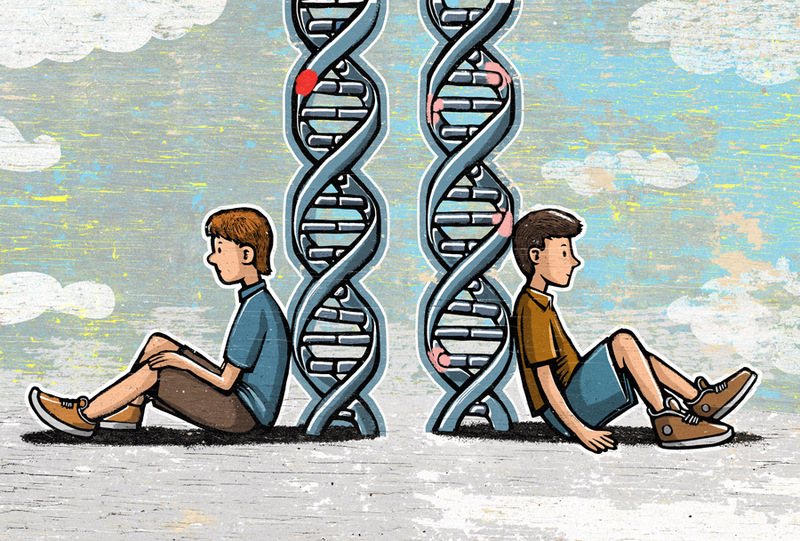 By comparing the exomes — the protein-coding regions of the genome — of these family members, researchers have tried to pinpoint de novo mutations in the child with autism. Looking instead at boys with autism who have low IQs may be “markedly more productive,” says Elise Robinson, instructor in medicine at Harvard University and one of the researchers on the new study. Boys who were unable to complete an IQ test also have an elevated rate of de novo mutations, the study found. These boys have the most severe behavioral problems, further reinforcing the link between de novo mutations and autism severity. Not everyone with a de novo mutation in an autism gene has severe symptoms, however. And many people with the disorder may carry both de novo and inherited risk factors. The milder symptoms, which may be the result of common variants found throughout the population, may shed light on important aspects of autism, she says. Simple questions, tools are available, but these dear researchers are trying to reach sun surface when everybody knows that it is impossible. During fever the sleep patterns return and autistic traits decrease because body is in a fight mode and starts fighting with the disease and the chemicals in the body. Immune system is not eating the brain. It is saving the brain from the toxic chemicals that are roaming in the body and the brain. Think of it like brain closing itself to avoid a much worse situation because of the chemicals that the body is unable to expel. I may recommend you to read Adeerus Ghayan’s books on Autism. He is of the belief that chemicals in the food chain and the air are contributing to ASD and if the autistic children are given farm fresh organic foods only, then their autistic traits start decreasing. My son has had the most comprehensive genetic testing available and there were NO abnormalities. Yet, he has severe autism ??? same here. my son is genetically ‘normal per his lab test results. Girls are more likely to have a single gene as the cause of their autism, and these single genes tend to have a significant impact. The title is misleading. Severity of autism is hard to define. These rare mutations lead to low IQ. Those with lower IQ aren’t necessarily more socially impaired. Our son has “severe” autism; aggressive and disruptive behavior, low IQ, his sibling is typical. We had our 4 exomes sequenced so we could look and see what’s different. What we see is many, many small changes in our son’s DNA. Some he inherited from his dad, and some from me, some rare, a few de novo. He has WAY more small changes than any of us. I’m guessing most DNA tests would come up with nothing causative like Dianne’s child above, so it may just be the combination of the large # of changes combined with rare and de novo variants. functioning labels are pretty much useless because they mean different things to different people. they don`t have anything to do with iq, for instance. they`re a subjective interpretation of what a person can do. many “low functioning” people recently have shown that they can communicate just like you or me when given the appropriate kind of communication tool that works for them. we`re currently going through a similar realisation with autism as there was with deaf, blind and mutes like helen keller. autistics are much more capable of “functioning” than people have given them credit for in the past. assuming no other especially disabling comorbids like intellectual disability exist. also, typical iq evaluations and quantifying systems do not work for autistics. autistics have a variety of iq levels in different areas so a single number doesn`t really reflect how smart they are or could be. Why are autistics with normal IQs look like the general populace in terms of De Novo deletions and duplications? What is going on with them? I would like to know.